BlackWidow is a website browser, offline browsers, website editor, mirror site, website management and maintenance, website browsers, website explorer, FTP and a website spy. Use it to scan a website and create a complete profile of the structure of a website, files, external links and even links with errors, such as "404 not found". BlackWidow will download all file formats such as images and photos, audio and MP3, video, document, ZIP, flash, program, CSS, Macromedia Flash, pdf, JAVA, PHP, CGI, HTM to MIME, etc.) from all websites. You can view, edit, copy and download the structure of a website. Program BlackWidow for websites that are impossible to scan. DiabloMiner accompanies you in the mining of bitcoins by performing complex calculations essential to find on the Web this famous virtual currency. You will then be able to carry out secure transactions with other participants. You don't always find what you're looking for on the Internet, up to the tenth page of results. 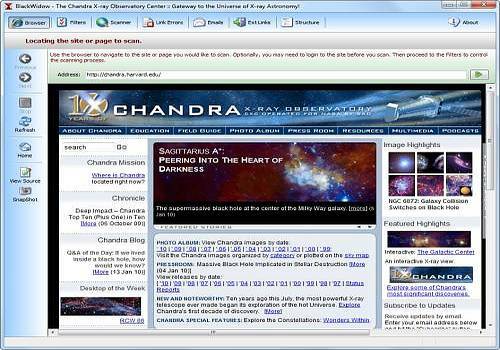 With WebSeeker, searches become optimal thanks to several search engines used to answer the user's request. MicSoft is here to help you design your "SiteMap" (the file that is used to refer your website). Advanced IP Scanner allows you to scan the network quickly and easily.